Scoliosis is a three-dimensional deformation of the spine, characterized by a sideways curvature and rotation. Signs and symptoms of scoliosis may include shoulder, waist and hip asymmetry. Scoliosis is diagnosed as idiopathic (cause unknown) in 80% of cases, but can present secondary to neuromuscular, congenital or syndromic conditions. Treatment of scoliosis primarily depends on the degree of spinal curvature, determined through x-ray evaluation. Most cases are mild, measuring less than 20 degrees of curvature, and often do not require treatment. These are usually followed closely by your Doctor or an Orthopedic Specialist. Spinal bracing is indicated for children with a progressive curve of greater than 20 degrees to prevent further progression until skeletal maturity is reached. Surgical intervention is considered when curvature progresses beyond 50 degrees. If left untreated, spinal curves of 70 degrees or greater are associated with long term health consequences including: disability, pain, physical deformity, functional limitations, pulmonary complications and an overall decrease in quality of life1. Scoliosis braces utilize the biomechanical principle of the three-point pressure system to passively load the spine to stabilize and prevent further curve progression. Scoliosis braces can be made of several different material combinations and styles. 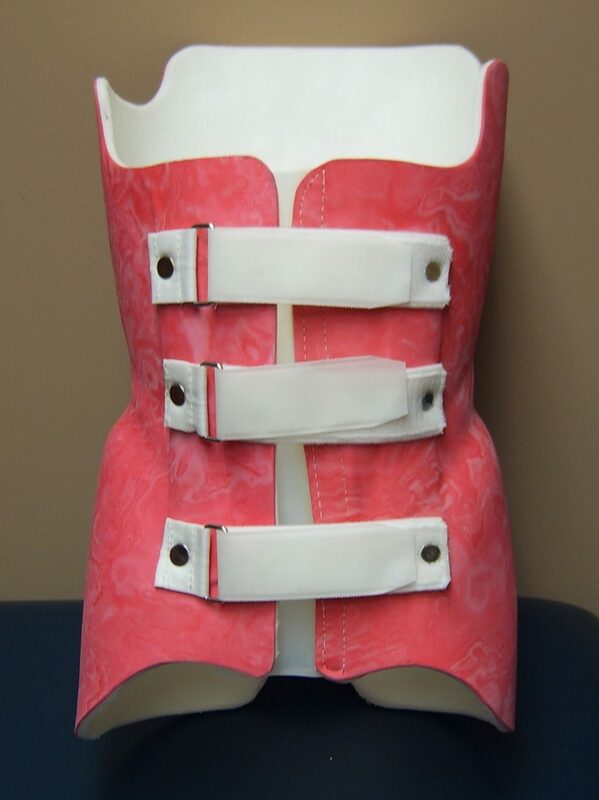 Typically, scoliosis braces are fabricated with a foam lining, thick waist roll and a thermoplastic outer shell. The opening can be anterior or posterior depending on donning preferences.